Can I buy Unison out without selling my home? Yes, you can! If you choose to buy us out, we will order an appraisal to determine the fair market value of your home. The payment you make to Unison will be similar to what you would pay if you sold your home. However, in order to prevent "cherry picking", Unison cannot share any losses with you when you buy us out. Since Unison's funding is not intended to be short-term financing, we do not allow you to buy out our investment during the first three years (in some rare cases the waiting period is five years). Our agreements call a "buy out" a "Special Termination". Learn more here. What is the minimum amount of down payment funding available with Unison HomeBuyer? The minimum amount we can contribute is 5 percent of the value of the home. What percentage of the future change in the home’s value will Unison share? Unison’s percentage share in the future change in the home’s value is variable depending on the amount invested and can be between 17.5% and 70% with the most common share being 35%. What are specially priced transactions for Unison HomeBuyer? In certain situations, Unison needs to use special pricing for transactions that involve more risk and which would therefore not qualify under standard pricing. Usually, special pricing involves increasing Unison's share of the future change in your home's value or decreasing the initial amount of funding provided by Unison. Special pricing can be helpful in allowing us to approve newly-built homes or those located in rural areas. It can also be helpful in approving customers with a lower FICO score or higher debt-to-income ratio. Am I allowed to rent my property in the future? Typically, Unison only invests in owner-occupied property. Unison’s standard pricing is for owner-occupied properties; However, special pricing may be available for the non-owner occupied property. If you pass away during the term of your agreement and you are not survived by anyone else who is on the agreement, then your heirs or estate will be required to settle the Unison agreement, after a 180-day grace period. Since your home does not automatically pass to heirs who are not signatories to the agreement, it’s important that you discuss your decision to enter into the Unison agreement with your heirs so that they understand the effect it could have on your estate. How does Unison affect my taxes? Unison is not a tax advisor and does not provide tax advice. We always recommend that you consult with your tax advisor for personalized advice, and we are certainly happy to speak with him or her directly. We believe that under current tax law, a homeowner entering into a Unison HomeBuyer or Unison HomeOwner Agreement should not have to pay taxes on the cash we provide you. Please contact us if you have further questions. What if the house has a Shortfall? In some rare cases, the proceeds of your home sale might not be enough to pay the sum of the selling costs plus the remaining balance on your mortgage and the amount you owe Unison. Usually, this only happens when your home has lost value and you haven't yet built up very much equity through monthly payments. If this happens, you are still responsible for paying the amount you owe Unison. What is the Owner Occupancy Requirement? Unison's HomeBuyer and HomeOwner programs are for homeowners who live (or will live) in the home. In order for your home to qualify as an owner-occupied property, you must live in the home for at least 180 days out of every 365-day period and must never be away from your home for 60 consecutive days. Unison does not invest in rental properties because they frequently suffer more wear and tear than owner-occupied homes, and therefore carry additional risk. How does Unison secure its interest in the property? We place a second lien on your property, behind your first mortgage lien. The document we use for this lien is very similar to what a second mortgage lender would use to secure its investment in your home. We also record what’s called a Memorandum of Agreement which gives public notice of our interest in and lien on the property. To learn more about the structure of our agreement, visit here. What does Unison need to know in order to determine whether they will invest in my home? We evaluate credit, income and your property, all of which can be done without any financial obligation to you or impact to your credit. Information about you. We look at your credit history, income, and other factors prior to partnering with you. We usually look for a FICO score of at least 680 and a DTI ratio of less than 43 percent. Information about the home. We also need to evaluate the home prior to partnering with you. Usually, the home needs to be your primary residence and must meet several other criteria for us to invest. If I choose Unison HomeBuyer, can I still refinance my mortgage in the future? Yes. However, your total loan amount cannot exceed 80% of the home's value. In other words, even after a refinance, your equity in the home along with Unison's investment must equal 20% of the home's value or more. For example, if you started out with a mortgage equal to 80% of the home's value and your home lost value since that time, you might not be able to refinance. While we always strive to give you flexibility, we cannot guarantee that you will have access to home equity loans or refinancing. What are the costs associated with Unison? For the Unison HomeBuyer program, Unison charges a 2.5% origination fee. There is no application fee or processing fee. You will, however, pay certain third-party expenses, such as closing services and credit reporting charges. How long does it take to close a deal with Unison? With the Unison HomeBuyer program, we work with your lender and meet the closing date that you and the seller have agreed to. Our programs are currently designed to invest in your owner-occupied, primary residence. This can include single-family homes, townhouses, and condominiums. In some cases, we invest in second homes and are happy to have you give us a call to see if your home or property qualifies. Prior to partnering with us, you can input your address — with no obligation — to see if your property qualifies. Simply click the button below to get pre-qualified. If I purchased a home and added Unison HomeOwner, what would the numbers look like? Unison’s investment payment to you was $160,000 minus any fees. This graph shows how much equity you would gain and how much you would share with Unison over this 30-year time period. As you can see, both your equity and Unison’s share increase when the home increases in value. This example is for illustration purposes only. To learn more about the mechanics of our agreement, visit here. No! The equity you build with your monthly payments belongs to you. We only share in the change in the value of the home over time. For example, if you purchase the home for $500,000 and sell it ten years later for $600,000, we will share a fraction of the $100,000 of appreciation. What is maximum authorized debt for Unison HomeBuyer? When you use our Unison HomeBuyer program along with a mortgage loan to purchase a home, your loan cannot exceed 80% of the home's value. In other words, your down payment funds plus Unison's funds must equal at least 20% of the value of the home. What is a Deferred Maintenance Adjustment? When you partner with Unison, you agree to keep your home in good condition and do routine maintenance as needed. For example, you would be responsible for ensuring that there are no leaks in the roof, that interior and exterior paint is not chipped or cracked, that electrical outlets and heating or cooling systems are in good working order, in addition to all other maintenance. If you fail to do routine maintenance, that could affect the value of the home whenever you choose to sell it. In that case, Unison would use a deferred maintenance adjustment to determine what the home’s value should have been. Unison’s share would then be calculated based on this adjusted sale price. To learn more about the mechanics of our agreement, visit here. Why does Unison require a home appraisal and is it accurate? A home appraisal is a report from a qualified professional that estimates the value of a home. When you buy a home, you will usually hire an appraiser to visit the home, review its condition and characteristics, find comparable properties that have recently sold in the area, and provide both you and the seller of the home with a fair estimate of its value. Appraisals are also valuable to lenders so they can verify that a property’s value is equal to what the borrower is paying for it. This reduces risk for both the borrower and the lender. At Unison, we require home appraisals to ensure an accurate home valuation when we are entering a HomeOwner or HomeBuyer deal. Unison uses independent professional services to ensure that our customers on both sides of the transaction are entering into the agreement based on an unbiased valuation. To do that we use Appraisal Management Companies (AMCs). AMCs are far-and-away the preferred means for obtaining appraisals in real estate transactions. They provide a “firewall” between lenders and appraisers, as required by federal guidelines. If you would like additional information about AMCs and their position in the real estate industry, please see this page on the FDIC website. HomeBuyer: When you purchase a home, in most cases your mortgage lender will require an appraisal. Unison does not require any additional appraisal of your home in this situation. HomeOwner: As with the title report and home inspection, Unison pays for the cost of the home appraisal. These costs are encompassed in the 3.9% transaction fee that we charge each customer. If you request a second opinion then a new appraiser will be sent to your home. Unison will cover the cost of the second appraisal if you choose to use a Unison program. However, if you choose not to do business with Unison, we will ask that you pay for half of the cost of the second appraisal. How much will Unison invest? Our investment can be between 5% and 20% of the market value of your home. Can I use the Unison HomeBuyer program with my 5% down payment? 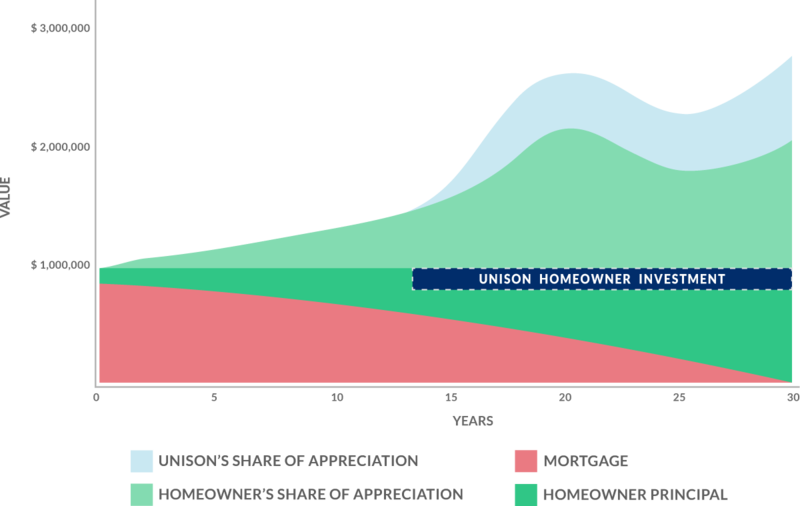 When you put down 5%, Unison invests 15% of the value of the home, leaving you with a mortgage balance of just 80% of the home's value. This means you will not have to pay PMI, which saves you additional money every month. Please talk with our Program Specialists to learn more about the program. Do you have to check my credit? When does that happen? Yes. However, this does not impact your credit score. As part of our pre-qualification process, we run what's known as a "soft" credit pull that does not affect your credit score. This usually happens when you submit the pre-qualification form on our website. Also, throughout the lifetime of our agreement, we will run soft pulls to ensure that you are continuing to meet the terms of our agreement. Again, this will not affect your credit score. Does Unison share in selling costs? No. When you sell your home, you'll be responsible for those costs -- just like you would for any other home sale. However, you should know that Unison's programs do not add any extra costs at the time you sell your home.